Question: I hear next Monday will be Leap Day. Why do we do that? And please keep your answer simple, because I’m not really that good at math. Thanks. — RO, Greenwich, England. Answer: OK, I’ll try to keep it as simple as possible, but you might want to take a look this post from January. You can stop reading after the third paragraph and avoid most of the math. If the math doesn’t bother you, read the whole post. Then come back here for the simpler explanation. But it will help to see my animation first. Unfortunately, I really can’t explain this without using math. We only need arithmetic — no geometry or trigonometry or calculus, I promise. First, here’s the purely non-mathematical answer to your question, as demonstrated in the animation: We need to have leap days because the true astronomical year is slightly longer than the (365 day) calendar year. If we ignored that fact, the error would accumulate. Eventually, your calendar would be telling you it’s Spring and time to plant. But outside, Mother Nature would be telling you it’s still Winter. 365.24220 days is the length of an astronomical year (one orbit of Earth around the Sun). Our calendar year is (normally) 365 days. That results in an error of -0.24220 days/year, but we initially round that to -0.25 days/year. Adding a leap day every 4 years yields an average calendar year length of 365.25 days (what we specified in the previous bullet). It’s a start, but that still leaves an error of 365.24220 – 365.25 = -0.0078 days/year. Leap days are normally added to years divisible by 4. If we skip 3 of those every 400 years (century years not divisible by 400), the average length of a calendar year = 365.2425 days. Now the error is only +0.0003 days/year. Thus, 3333.3 years after the start of this calendar scheme (adopted in 1582), the calendar will be one day ahead of Nature. That will happen in 4916. 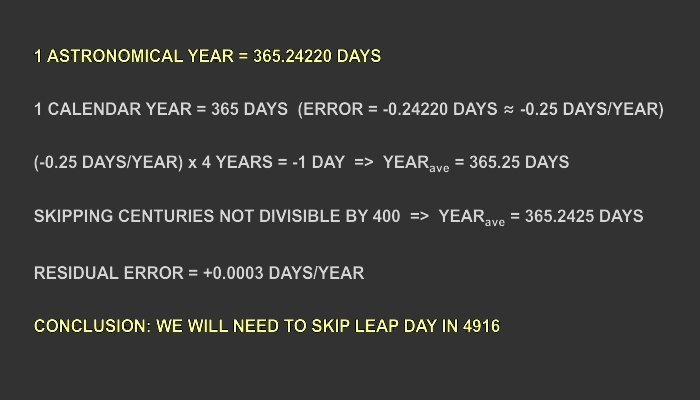 So even though 4916 is divisible by 4, we’ll skip leap day that year. We might be in even better shape than that. The following scheme, devised by Adam P. Goucher, a mathematician at Cambridge, is even more precise: years divisible by 128 are not a leap year, otherwise years divisible by four are a leap year. The residual error here would be a mere 0.000002315 days/year. His calendar would be good for 500,000 years, but was only recently suggested, and is still not universally accepted. It’s just a proposal. IMHO, by the time that year rolls around mankind will have expanded to other worlds. Our terrestrial calendar won’t work on other planets with different orbits and spin rates. They’ll need a new calendar on every planet colonized. For example, a day on Mars (officially called a “sol”) is about 40 minutes longer than a day on Earth. A year on Mars takes 687 days or 669 sols. Try building a calendar around those numbers. Note: The use of weeks and months on a calendar is arbitrary. Days of the week are mostly a social convenience, with no astronomical significance. The month is tied to the motion of Earth’s moon, and makes identifying seasons more intuitive. Alas, the two moons of Mars are in orbits that preclude that application. There have been some Mars calendars proposed, but none yet officially accepted.